Dr. Kriteman practices general urology with a particular interest in male and female voiding dysfunction, and treatment of enlarged prostate (BPH) utilizing minimally invasive procedures such as Urolift and Rezum. He specializes in laser procedures of the prostate acting as instructor for the Greenlight laser procedure across the country and around the world. He has presented numerous papers at both national and international meetings. He is a member of the American Urological Association and a Fellow of the American College of Surgeons. 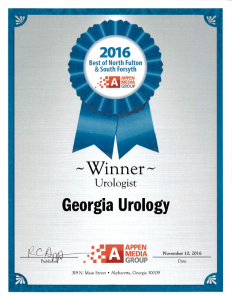 I recommend Dr Lewis Kriteman & his staff at Georgia Urology very highly. He has performed several procedures with no ill effects and along with a pleasant bedside manner always addresses my concerns & answers my questions in language I can understand. I am confident that I am getting the best possible care & outcomes with Dr Kriteman & Georgia Urology. I have been a patient of Dr Kriteman for several years and could not be more satisfied with my treatment. He has always told me my options and described the treatment plan in detail. I have been seeing Dr.Kriteman for a few years now. One O don’t wait long to see him. Two he has always taken his time explaining things you never feel rushed. Three he understands my concerns when I have them and totally explains the options in layman’s terms. Four I trust him completely. Guy C.
I recently met Dr. Kriteman for the first time having been referred by my primary physician. In preparation for my visit, I wrote a one page letter to him explaining health issues as they might relate to my current problem. When I met him he had already read my letter. He responded to me by giving me a brief education about my issue. He then explained the 3 step process he would use to see what I was dealing with, if anything at all. His humor and calm has relaxed me greatly and is appreciated. I feel comfortable dealing with him going forward. Dr. Kriteman and his staff are excellent. I am a retired physician. I would highly recommend Dr. Kriteman. It took me awhile to get up the courage to so see Dr. Kriteman but he immediately made me feel at ease. He explained my various options, gave me literature to read and set up the various diagnostic procedures I would need. We have a plan. He is always very professional as are his staff. I have been going to him for years. Rarely have to wait long to see the Doctor. Office and medical staff are efficient and friendly and Dr. Kriteman is as good as it gets. Dr. Kriteman has been my Urologist for over 10 years. He is open, friendly and very professional. I have a great deal of confidence in his ability to provide excellent care.